The year is not yet complete, and so Piaget’s 60th birthday celebrations for the Altiplano still have a couple of months to go. Earlier this year we covered the our favourite so far, the ‘blues’, as well as a high jewellery celebratory piece. Those who follows us on follow us on Instagram will have seen some Altiplanos of other hues. 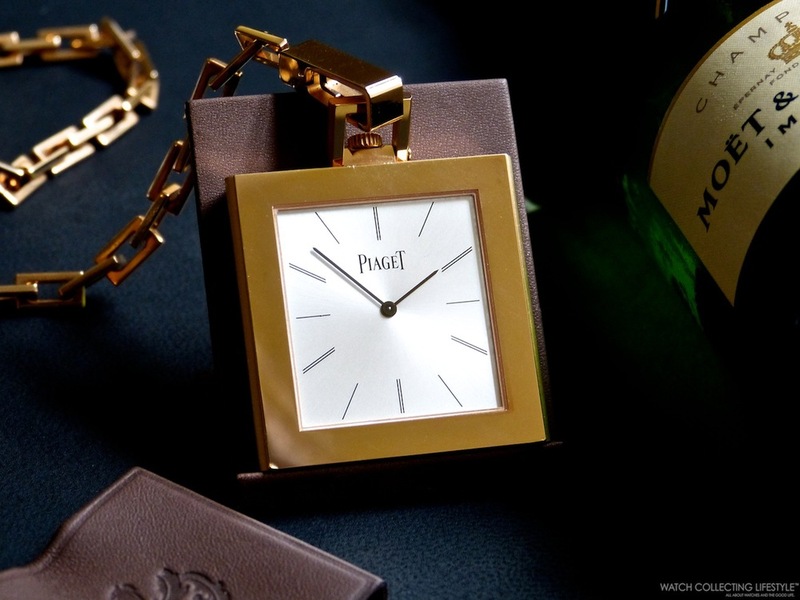 Piaget’s anniversary timepieces have not been confined to the wrist – meet the limited edition anniversary pocket watch. It is ‘that’ blue, in a sunburst dial that comes with a matching blue calfskin case and leather strap that replaces a traditional chain. As per one of the two blue wristwatch anniversary models, this pocket watch also has the fine blue cross hair that once adorned early Altiplanos, on its dial. Inside the (slim, of course) 50mm white gold case (and visible through the sapphire case back) is the ultra-thin (2.35mm) automatic Calibre 1200P, which beats at 21,600VPH and has a power reserve of 44 hours. The movement has circular Côtes de Genève decoration, bevelled bridges, a circular-grained main plate, and blued screws. The metal of the case continues onto the baton hands and hour markers, which are also white gold. But wait, there’s more! The pocket watch can be transformed into a table clock when placed in the centre of a blue marquetry stand that features long slim lines that act as an extension of the hour markers of the watch. 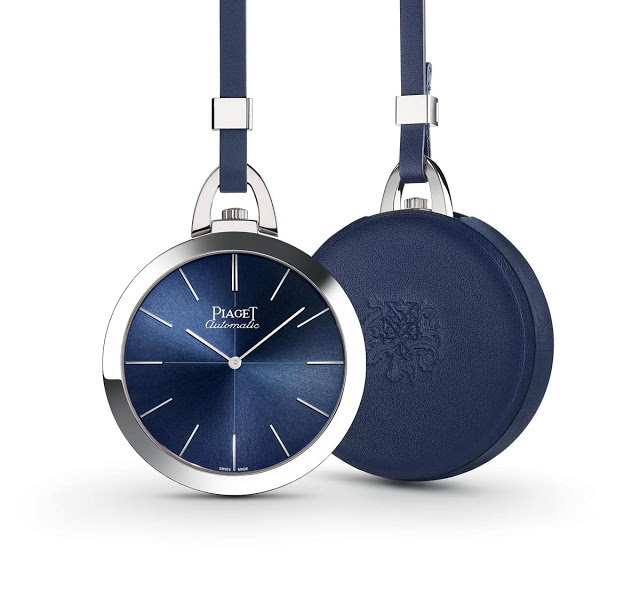 This pocket watch is, essentially, the 60th Anniversary blue model writ large, but in so doing, Piaget have created, in my view, something not only quite beautiful, but also, very wearable. There have been a number of pocket watches in recent years that I have admired, but some of them have simply been of a style and/ or size that renders them a bit more challenging for regular use. This one, with its slim form and leather strap, strikes me as something that I would be comfortable using with some frequency. The addition of an equally elegant and attractive watch stand that stylistically reminiscent of the era (or even earlier) from which the Altiplano harks, merely adds to its appeal. When the Altiplano turned fifty, there was also a commemorative pocket watch released by Piaget (see below). The slim square case contained the Calibre 9P beneath a solid engraved case back, and had a traditional chain instead of the leather strap. Quite a different horological beast to the 60th anniversary commemorative model. Limited to just 26 pieces, the new Altiplano 60th Anniversary Pocket Watch has an RRP of 68,000 EUR.